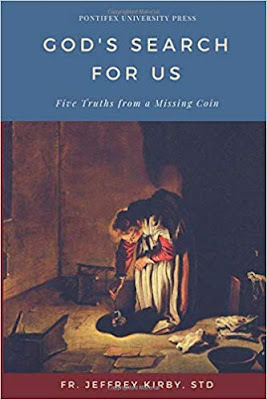 So begins Fr Jeffrey Kirby’s wonderful new book, God’s Search for Us - Five Truths from a Missing Coin. If we are to transform the culture, we must first be transformed supernaturally in Christ (this is the foundational idea that underpins The Way of Beauty) But we cannot be transformed unless we respond to God’s love first, not by reaching out and grasping Him, but rather by an ordered acceptance of Him. In describing this, he echoes the writing of Benedict XVI who referred to this dynamic of love as a twofold movement of agape and eros. Agape is the self-giving love and eros is that ordered acceptance. We cannot have one without the other, for there is no gift without reception. So God has given Himself to us, and that love is not realized, so to speak, until we accept Him. Then we are transfigured and can, in turn, give ourselves back to God and to man in a reciprocating act of agape. When we enter into this mystery - the dynamic of love which begins with His love for us - we are joyful, and it is our joy that draws others to Him. It is my observation that so many today, Catholics and non-Catholics alike, are searching. They search desperately, fruitlessly and some do so without even knowing what they are really looking for. At the heart of this unfulfilled, frenetic activity is a search for God. It fails so often because those who search fail to appreciate fully that happiness is not something that is grasped, but rather something that is accepted, and then must be given away if it is to be retained. This is the great paradox of life. This book is a meditation on that first act of love, which precedes all other love, and by which all human happiness is made possible. Using the parable of the lost coin as its starting point, Fr Kirby leads us into consideration of this mystery. It is hoped that this will take us to a deeper encounter with God, so that we may, in turn, love our fellows and give greater glory to Him for the good of all mankind. The primary encounter with God, in which every human encounter with God participates, is in the worship of the Father, through the Son, in the Spirit, and in this life. All our human activity, even the most mundane, ought to be in conformity with this end. So it is by our participation in the liturgy that we are most likely to consummate that love which is already given. This motion of acceptance of Him, deep in our hearts, is the one that will give momentum to all change for the good that might ultimately be manifested visibly in a transformed human society and culture. 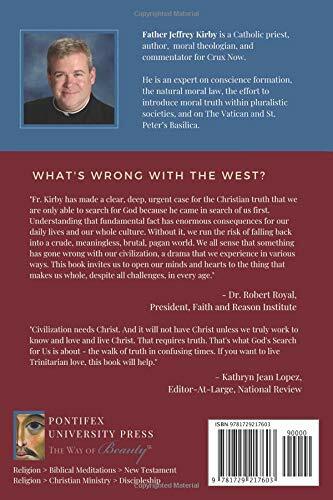 For all that this book contains profound truth, Fr Kirby’s prose is accessible and clear and through this, he makes its noble themes available to many. I suggest that this could be a good text to study as an Advent meditation in your parish or book club. You can purchase it from Amazon.com, here. Father Jeffrey Kirby is the pastor of Our Lady of Grace Catholic Church in Indian Land, South Carolina. He holds a doctorate in moral theology from the Holy Cross University and is an adjunct faculty member of Belmont Abbey College in Charlotte, North Carolina. God’s Search for Us: Five Lessons from a Missing Coin is Kirby’s tenth book.